Let me introduce myself — my name is Melanie and I’m a coach. Not the kind of coach you’re used to — I’m one you’ll never need. I’m a “food coach” for little kids, otherwise known as a pediatric feeding therapist. Not a lot of people realize that for some kids, eating and growing is hard work. Seems like growing is something you did pretty easily — all 6 feet 7 inches of you. That’s cool — you’re a good guy and should stand out in a crowd. Turns out, we’ve got a mutual friend and she’s a very tiny 6-year-old. She’s been stuck at Rocky Mountain Hospital for Children for weeks, having surgery after surgery, test after test. Santa’s elves had to decorate her hospital room for December 25 because she wasn’t going to be able to go home that day. Her family was going to have to try their best to celebrate Christmas at the hospital — Mom, Dad, sisters and my little friend. But that morning, you weren’t celebrating Christmas at home either. 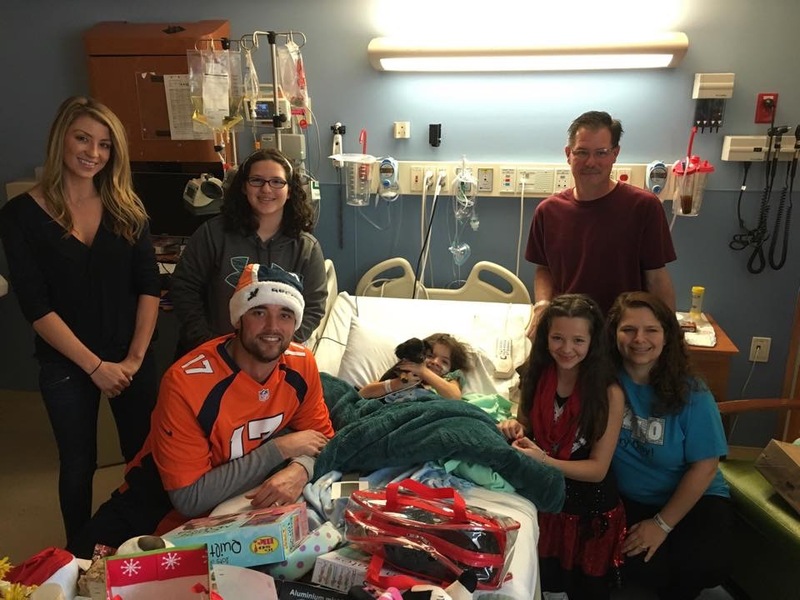 You and your gracious wife showed up early on the morning of December 25 to surprise the kids at Rocky Mountain Hospital for Children. With your “Bronco orange and blue” beanie perched on top of your head, you made the rounds from room to room, spending time with each and every family on Christmas. That morning, I saw the photos on Facebook of this tiny tot, who effortlessly grinned from ear to ear, despite the feeding tube and medicines surrounding her. Her dad beamed proudly as you took pictures with all of the family. Clearly, from the look on her big sister’s faces, they were feeling pretty cool to be hanging out with you that morning! Her mom immediately posted joyful messages to update friends and family, quite different from the concerned messages we had been reading for days. And me, I breathed. I felt such a sense of relief. Our little friend was having one of the best Christmases ever, thanks to you. Full disclaimer: I noticed Santa surprised her with a real-live puppy that morning. But what little girl doesn’t want her own Bronco, too? Lucky kid got both. The Mighty is asking its readers the following: Describe the moment a stranger — or someone you don’t know very well — showed you or a loved one incredible love. If you’d like to participate, please send a blog post to [email protected] Please include a photo for the piece, a photo of yourself and 1-2 sentence bio. Check out our Share Your Story page for more about our submission guidelines. Melanie Potock, MA, CCC-SLP is the co-author of “Raising a Healthy, Happy Eater” and a national expert on feeding children. For more info, please visit My Munch Bug and Parenting In The Kitchen.